The club are fairly young, having been founded in 1985. They were known as Purfleet until 2003, and it was under that guise that I saw them lose 1-0 to Yeading in 1995. They initially plied their trade in the Essex Senior League, joining the Isthmian League in 1988. Their highest ever finish came in 2005 when they finished 3rd in the Conference South. They suffered a double relegation, finishing bottom twice in a row in 2012 and 13. They now find themselves in the Isthmian D1 North. They are most well known for a couple of cup runs in the early 2000's which saw narrow defeats to league sides Oldham Athletic and Luton Town. The club is a regular place for well-known league players to see out their careers and their current manager is former Gillingham and Stevenage boss Mark Stimson. I had a rare Sunday off work and so I decided to make the trip to Ship Lane, Thurrock, to see the home side's game against Aldershot Town. The main reason for going was to see former Wycombe striker Johnny Dixon, but looking at the lineups there would be several future Wycombe players featuring, including Nikki Bull, Dave Winfield and Will Antwi. 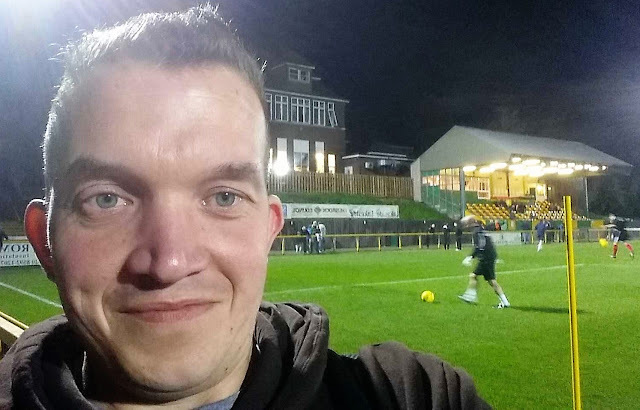 And despite Aldershot being much higher up the pyramid, Thurrock triumphed 1-0 with a goal from Cliff Akurang, before a fairly big attendance for Thurrock of 613. All in all an entertaining game and a good day out. Originally I was planning to go somewhere in Wales on this day. But it looked as if it was gonna absolutely bucket down in the west, and I didn't want to risk a wasted journey. Initially, I thought I was gonna go to Northallerton Town when it clocked in at 193 miles each way. But then I realised that Google Maps has a nasty habit of getting confused over my workplace, and when the extra 50 miles were added it made it too expensive - over £50 in fuel. I thought that I would be matchless for the first part of my week off. But then I spotted Thurrock were at home, and knowing that I needed a programme from there as I had not picked one up on my last visit, I decided to head there. I did my work as usual and was overjoyed to clock out at 1PM, knowing that I would not have to be back in for 8 days. I went home, had lunch and a bath, and had a very short time at home before leaving at 2.30. The M25 was fairly good, the roadworks and a delay near the Dartford Crossing were all it could throw at me. I had a plan in mind and executed it well. There was a pub in Grays that I fancied going to, called 'The Traitors Gate' It was supposed to stock New Forest Cider, which I had not yet had. As it transpired, I may or may not have had it. The barmaid was a stereotypical Essex girl, lovely lass, but a bit orange. She said she had Old Rosie (which I had had) plus 2 where she couldn't see the label. I just told her I would have one of those unidentified ones, and whatever it was, it was very nice. I then left the car where it was, walked the mile into town, buying some diet Irn-Bru, a PS2 game (Driver) and an aftershave gift set from 99p stores (yes, nothing but the best for me) I looked around a few other shops, bought my Mum and Dad a card for their Ruby anniversary (we are having a curry for it, how cool is that!) and then walked back. I stopped at Hong Kong takeaway, getting a very nice Chips, Spring Rolls and Curry sauce, which even for the cheap price of £3.60 was a ludicrously small portion. I then made the 5-mile drive to the ground. I must have been one of the first in, at around 6.45. Before I'd gone in I had a good chat with fellow groundhopper Jack Warner, who was on 91 games for the season, compared to my 59. I paid £6 entry which was cheap because of them offering a discount to season ticket holders of league clubs. I also bought a thick programme, full of good articles and stats for £2. 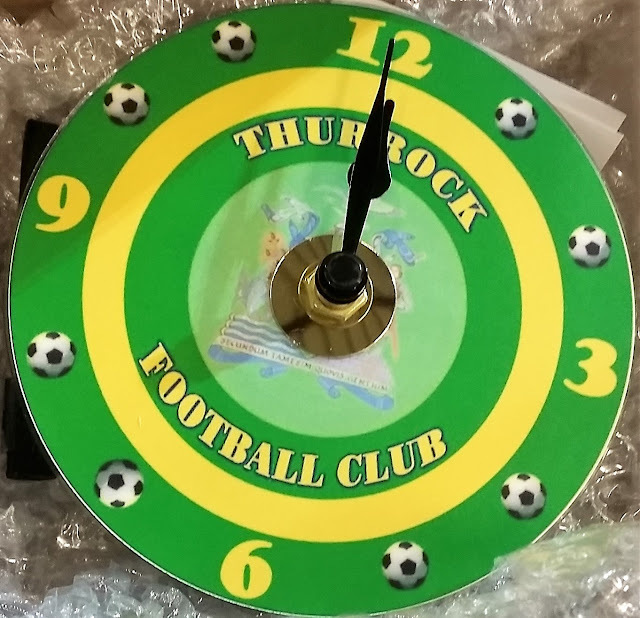 First stop was the club shop, where I bought a nice little clock for £4, which made a change from the usual stuff. As there was a bit of time to kill until kick off, I decided to go in the bar for a pint and to read my programme. After that, I came out and got some new pictures of the ground, and got myself a burger, as I was still hungry. 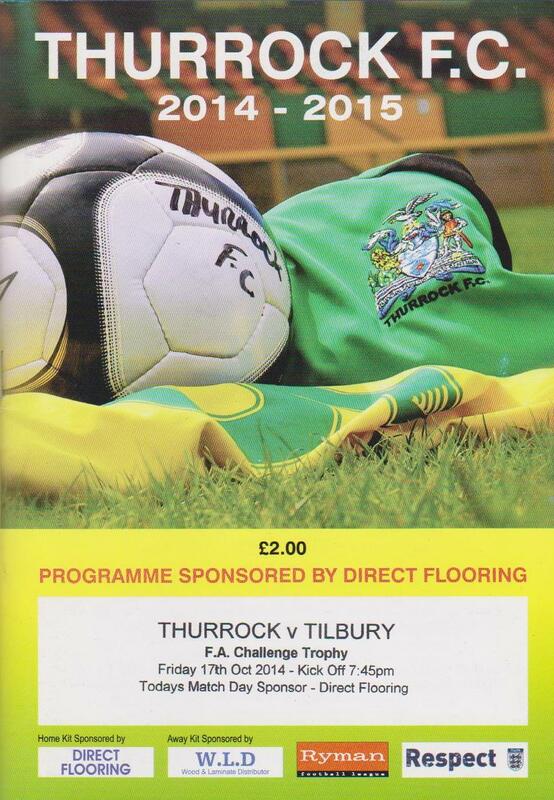 The game was a real corker, 4-3 to Thurrock and real end to end stuff, that either side could have won. Tilbury certainly didn't look like a side on a bad run and could have justified a win. 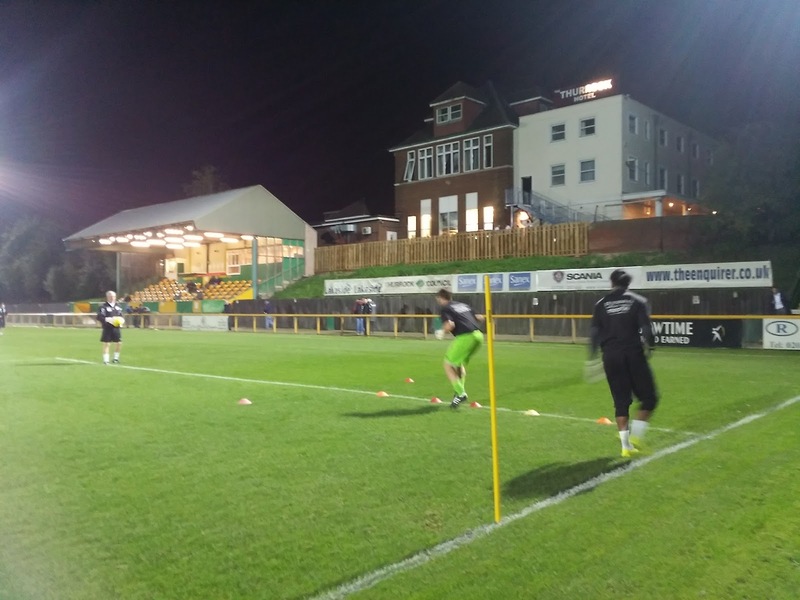 There was a hat-trick for Thurrock's Ross Wall, and former Wycombe player Lewwis Spence also captained their side. After the game. the drive home was a lot easier. I was back home by 11 and had a couple of pints while looking on the internet and typing this blog. I also had a look at the free newspaper I had picked up without a second thought whilst in Morrisons. It was very good, with plenty of non-league content, and even a preview of tonight's game. Contrast that to our local paper, costing nearly a quid, which has a lot loss content on our regions non-league teams.